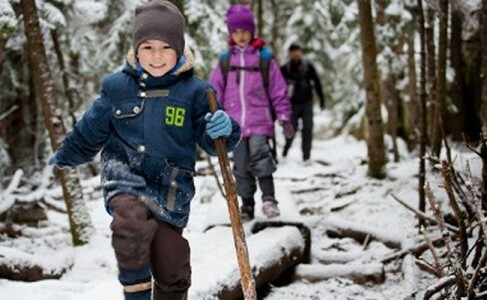 On New Year’s Day, why not take the family outside for a good healthy First Day Hike. Montana State Parks joins other state parks across the country to begin the new year with a healthy hike outside. Chas Van Genderen, Administrator for Montana State Parks, will be hiking at Spring Meadow Lake State Park, in Helena, and encourages all Montana families to join. This annual and nationwide event is sponsored by America’s State Parks. Last year, about 14,000 people, hiked 30,000 miles in state parks. The hike begins at 11:00 a.m. at the visitor center. Bluebird Trail leads through winter formations carved into the snow drifts by the wind. A park ranger will lead the tour and share information about the park’s unique geology, wildlife and history. Hot chocolate will be provided at the end of the hike. For more information, call Park Manager Ryan Sokoloski at 406-377-6256. Click here for directions. The hike begins at 1:00 p.m. in the FWP Billings headquarters office parking lot for a hike of nearly 1.5 miles. Snowpack permitting, cross-country skis or snowshoes may be used on the trail that runs next to Lake Elmo. Wildlife viewing may include waterfowl, pheasant and deer. For more information, call Park Manager Terri Walters at 406-247-2940. Click here for directions. The hike begins at 10:00 a.m. at the main visitor center on the lower level for a moderate hike of 2 – 3 miles, depending on the weather. For more information, call Park Manager Lynette Kemp at 406-287-3541. Click here for directions. The hike begins at 12:00 p.m. at the visitor center for a 3.5 mile hike. First Day hikers will learn about the history of First Peoples Buffalo Jump State Park and see some amazing vistas. For more information, call Park Manager Richard Hopkins at 406-866-2219. Click here for directions. The hike begins at 10:00 a.m. at the park entrance on Broadwater Ave. off of Country Club Ave. Join the park’s staff for a short hike around the lake to watch wildlife and hear about the park’s history. For more information, call Ken Soderberg at 406-444-3701. Click here for directions. The hike begins at 11:00 a.m. and hikers will tour trails throughout the park and enjoy a warming fire by the picnic shelter. Adults and kids should be up for a 1 – 2 mile hike in a forested area populated by song birds, squirrels, and white-tailed deer. For more information, call Park Manager Amy Grout at 406-755-2706. Click here for directions. For more information about First Day Hikes, visit Montana State Parks website.